Ex-neighborhood watch volunteer George Zimmerman called police at least six times in the months before he shot Trayvon Martin to death. ORLANDO, Fla. — Ex-neighborhood watch volunteer George Zimmerman called police at least six times in the months before he shot Trayvon Martin to death, reporting activity as benign as kids playing in the street to detailing the description of a suspected burglar. The documents and recordings released Thursday point to Zimmerman’s growing frustration with suspects getting away with petty crimes in his gated community, though they do little to clear up what happened on the night of the shooting. In August 2011, Zimmerman called Sanford Police’s nonemergency line to report a man in the neighborhood who his wife thought was responsible for an earlier burglary. “If you’ll let the officers know they typically run away quickly and I think they head to the next neighborhood over,” Zimmerman said in the call. When asked by a dispatcher, Zimmerman said the suspect was black. His wife, Shellie, is heard in the background telling Zimmerman not to go outside to follow the suspect. In a Feb. 2 call, less than a month before the fatal shooting, Zimmerman described a suspicious man at a neighbor’s house. When asked, he said the man was black, wearing a black leather jacket, black hat with ear flaps and black pajama pants. On Feb. 26, Zimmerman’s response was different. He spotted Martin walking through the gated community in Sanford. Martin was walking back to a house he was staying at in the community after a trip to a convenience store to buy Skittles and a can of iced tea. Zimmerman started to follow him. Despite a police dispatcher telling him “you don’t have to do that,” Zimmerman gets out of his truck to pursue Martin. “These a——s, they always get away,” Zimmerman said on the call. The calls were among close to 50 that Zimmerman made to Sanford police over the past eight years. 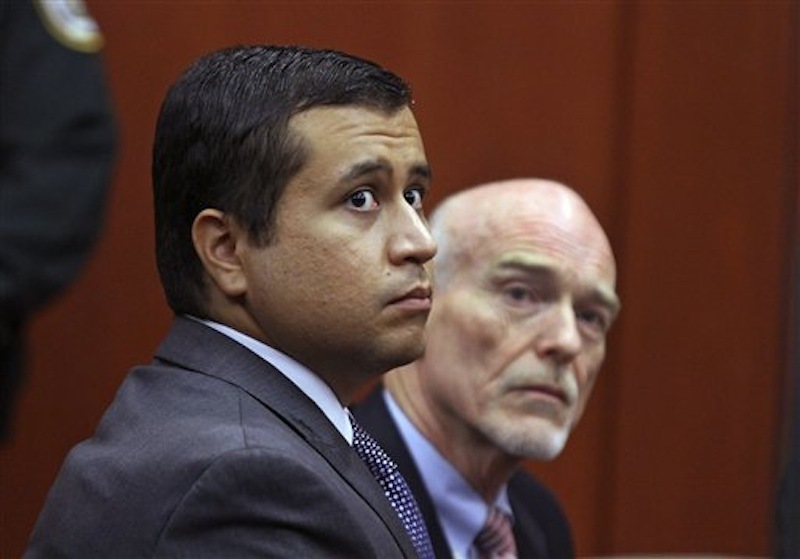 Prosecutors and Martin’s family believe the teenager was racially profiled by Zimmerman. Martin was black. Zimmerman’s father is white and his mother is Peruvian. The lead detective investigating Martin’s death told FBI agents that he believed Zimmerman followed Martin because the teen was wearing a hoodie and because of previous burglaries in the community, not because Martin was black, according to the documents released Thursday. Local gang members were known to wear hoodies and the gated community had had a rash of break-ins, many by young black men, neighbors told police. Detective Chris Serino described Zimmerman as overzealous and as having a “little hero complex” but not as a racist, according to the FBI report. The FBI has been probing the handling of Martin’s death for any civil rights violations, but the agency hasn’t released any findings. The unidentified woman, who was engaged to Zimmerman a decade ago, told agents he had a temper but added she thought it was exacerbated by his use of acne medicine. During arguments, he would sometimes threaten to kill himself by driving into a lake or taking pills but the ex-fiancée believed he was only trying to generate sympathy and wasn’t serious. The ex-fiancée described a tempestuous relationship that culminated with her filing for an injunction against him after a breakup; Zimmerman also filed one against her. Also released were police officers’ descriptions of cuts on Zimmerman’s head and print outs of what is described as Zimmerman’s MySpace page. “I don’t miss driving around scared to miss Mexicans, walkin on the side of the street, soft as wanna be thugs messin with peoples cars when they aint around,” one entry said. Zimmerman, 28, is charged with second-degree murder in the February shooting. He has pleaded not guilty, claiming self-defense. Who cried for help is a point of contention. Martin’s family claim it is their son in background of 911 calls neighbors made. Martin’s cousin, in an interview with the prosecutor’s investigator, said “without a doubt ‘on a stack of Bibles'” that the cries were those of Martin. Zimmerman’s father testified at his bond hearing that he was certain the shouts for help were his son.